The Chicago and North Western (C&NW) Railroad completed this bridge in September 1907. The bridge provided the first permanent Missouri River crossing in central South Dakota linking eastern South Dakota and the west river region. It also connected western South Dakota to Minnesota and the upper Midwest. Before the building of the railroad bridge, people crossed the river between Pierre and Fort Pierre by pontoon bridges, steamboats, and by walking across the ice in the winter. The Chicago and North Western Railroad laid tracks to Pierre by 1880. The company announced plans to expand the line across the Missouri River and on to Rapid City and the resource-rich Black Hills in September 1905. Major work commenced in the fall of 1906 and was complete in September 1907. 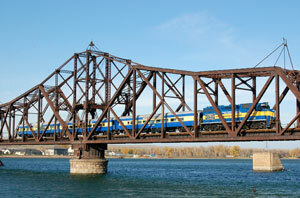 The first passenger train crossed the bridge October 14, 1907. A decline in rail traffic caused the C&NW to sell the line to the Dakota, Minnesota and Eastern Railroad (DM&E) in 1986. Rail traffic soon increased under DM&E ownership. The C&NW played an extremely important role in the settlement of much of South Dakota. By the late 19th century, much of eastern South Dakota had railroad service, but few railroads ventured into western South Dakota, partially because of the large areas closed to white settlement. By the 20th century though, the reduction of the size of reservations opened the rest of the land for settlement. The railroads almost immediately built bridges to cross the Missouri River and laid tracks in western South Dakota to reach Rapid City, the urban gateway to the Black Hills. The 2,200-foot bridge is a multi-span pin-connected Pennsylvania through truss design with steel superstructure. The bridge is set atop granite-faced piers. The Pennsylvania design was for long-span applications requiring heavy carrying capacities. The second span from the east end of the bridge is a swing span that would rotate open to allow passage to high-clearance boats. The swing span is no longer functional. The Chicago and North Western Railroad Bridge is the only swing bridge remaining in South Dakota. The Chicago and North Western Railroad Bridge follows US Hwy 14/83 and SD Hwy 34 and is located over the Missouri River between Pierre and Fort Pierre. For more information, visit the South Dakota State Archives Chicago & North Western Railroad Bridge Construction website.